God observes that humanity is corrupt and decides to destroy all life. But "Noah was a righteous man, blameless in his generation, [and] Noah walked with God," and so God gives him instructions for the Ark, into which he is told to bring "two of every sort [of animal]...male and female ... everything on the dry land in whose nostrils was the breath of life," and their food. God instructs Noah to board the Ark with his family, seven pairs of the birds and the clean animals, and one pair of the unclean animals. "On the same day all the fountains of the great deep were broken up, and the windows of heaven were opened, and the rain was upon the earth," and God closes up the door of the Ark. The flood begins, and the waters prevail until all the high mountains are covered fifteen cubits deep, and all the people and animals and creeping things and birds of the heavens are blotted out from the earth, and only Noah and those with him in the Ark remain. ^ Klaus K. Klostermaier (2007). A Survey of Hinduism. SUNY Press. p. 97. ISBN 0791470822. ^ Wendy Doniger (2009). 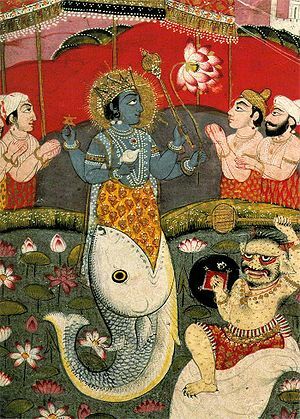 Hinduism:An Alternative History. Penguin Books. ISBN 978014311691. This page was last modified on 24 November 2011, at 18:17.